Shearing Day is a time of teamwork and sharing. Alpaca owner, friend and family come together to assist in this fiber harvest. 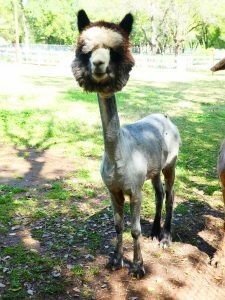 The key to shearing alpacas is to be quick and efficient as possible as that reduces the stress on the alpacas. Shearing day is also a great time to trim toenails and give their annual shots. 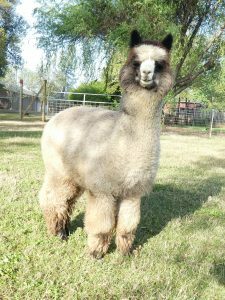 While some alpacas are frightened by the activity and noise, all alpacas enjoy a good romp in the pasture when the winter coat is removed. The shearing begins by restraining the alpaca’s front and rear legs and then laying them on their side. The shearer starts with the belly and works their way up to the backbone, removing this blanket in one piece. He then removes the fiber from the neck and legs. The alpaca is rotated and the process is repeated on the other side. The rest of the team is trimming toenails, giving shots, gathering and sorting fiber, and checking the teeth. Alpaca fiber is gathered into 3 bags. Bag 1, is the Blanket, the best fiber on the animal. Bag 2, is the neck and shoulder fiber, this can be as good as the blanket but is usually shorter. Bag 3 is the belly and leg fiber. ALL the Alpaca fiber is useable. Alpacas generally shear 6 to 10 pounds of fiber. The entire shearing process only takes about 10 minutes per animal.